Toby Jugs have been produced for many years, and although there is some dispute amongst collectors as to their exact origins, it is thought that the first ones were made around the mid 1700's . A Toby Jug is a full-length figure - more often than not male, (although there a few females too), and is dressed from head to toe in the clothing associated with the 18th Century: - a long frock coat, tricorn hat, knee-length breeches, waistcoat and neckerchief. He is usually depicted as a rather drunken character who is clutching a large beer jug, drinking glass or both. Sometimes he is holding a pipe or snuff box! Other collectors think there could be a connection to the "Low Toby" - similar to a Highway Man, but on foot rather than on horseback (the equivalent of the modern-day mugger!). My feeling is that he could be inspired by a number of illustrations of the time - a particular one being the one illustrated below. 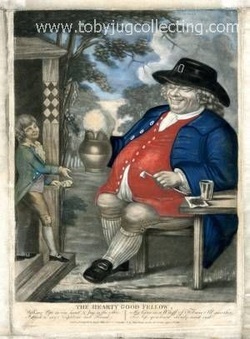 This print entitled "The Hearty Good Fellow" is attributed to Francis Hayman (1708-1776). The title of the print is in fact also the name used for a Toby Jug. 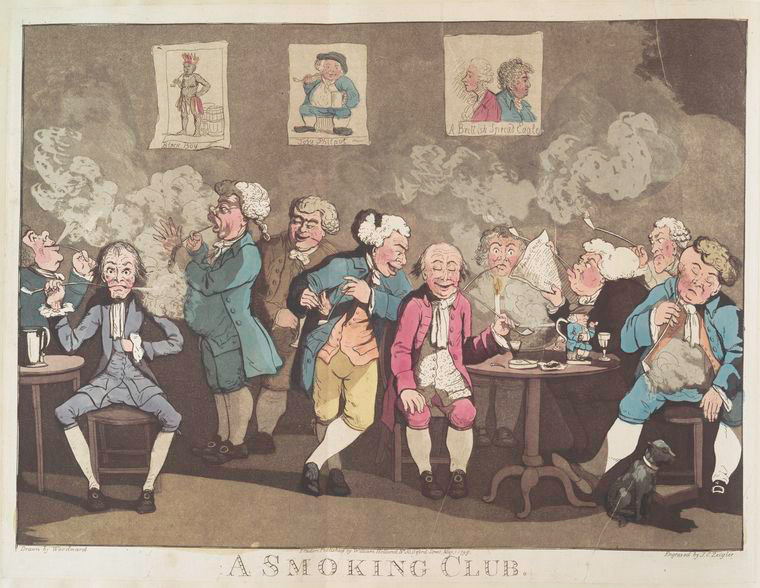 For Life you know shortly must end"
In the engraving (left) dating from the early 1800's, you can see a group of bawdy looking gentlemen who are smoking their churchwarden type pipes and drinking ale. If you look closely at the table to the right hand side of the picture, you can see a Toby Jug sat upon the table! This suggests that Toby Jugs may well have been used in Taverns and Clubs as a functional item for serving beer and ale and not just for decorative purposes. Whatever the inspiration, the Toby Jug is generally depicted as a rather rogueish character enjoying the excesses of the time in one way or another! - Be it drinking, smoking, taking snuff etc. Often they look a little "worse for wear" and their character illustrates what life was really like at the time, with many of them having pox marks, missing teeth etc. The majority of collectors feel the best Toby Jugs were produced during the mid 18th to mid 19th century, many of them with great skill and attention to detail in the modelling and painting. Some of the finest early jugs were produced in the Staffordshire Potteries in England by the likes of Ralph Wood, Whieldon, Walton, Astbury etc and nowadays it is these jugs that can command high prices. From the mid 19th century onwards, new techniques and mass production methods meant Toby Jugs were being more freely produced, and on the whole, these jugs are easier to find today (although, as with everything there are always exceptions). In addition, as potteries have risen and fallen these jugs have become less available and more collectable. If you would like to see some of the different types of toby jugs, please visit the Toby Jug Gallery or click on the links below to view the other pages. All images & text protected by copyright, unauthorised use of any of the content strictly prohibited.